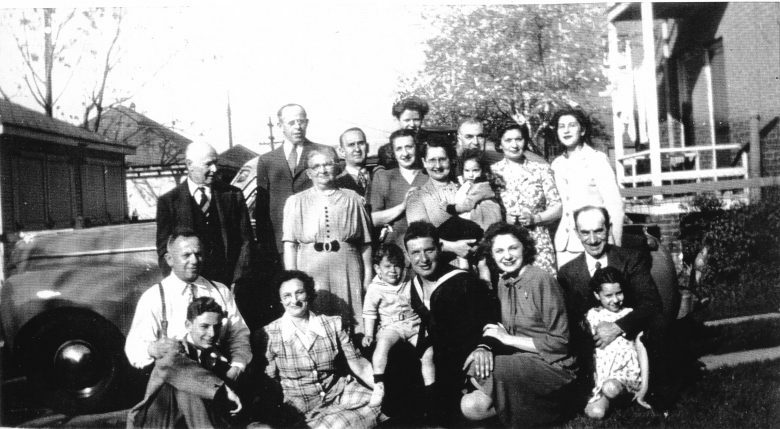 In this World War II-era photo (1944) taken in the backyard at 2476 Clements, between Linwood and LaSalle, in the Central High School neighborhood, you can see three generations of the Cook and Teitel families. Jerry Cook of West Bloomfield, who submitted this photo, is the youngster sitting on his father Oscar’s knee in the center foreground. Oscar is about to depart from the Midwest during his two years of naval service. Jerry’s mother, Jeanette Teitel Cook, is next to his father. She is the daughter of Morris and Bessie Teitel, seated to the left of Jerry. Oscar’s parents, Meyer and Fanny Cook, are behind the Teitels. Missing from the photo are four men already gone into WWII service. They included Jeanette’s brother Ben Teitel, whose legacy is preserved in the Metro Detroit community through programs and buildings created with funds from the charitable trust established under his will. The other three men were Sam Cook, and Earl and Bernie Friedman. During the war, Jerry’s grandmother Bessie removed the lawn and planted a victory garden to raise vegetables because farmers’ food was necessary to ship to the troops abroad. Two of Jerry’s cousins, Elaine Cook Epstein (in the back row, far right) and Barbara Ettinger Goodman (held by her father, Adolph), still live in Metro Detroit. Barbara was recently honored at JSL’s 8 Over 80 event. Jerry is a past president of the Michigan Jewish Historical Society. This photo and many others are including in the Cook family “Cook Book” that’s full of family history. This photo was taken in Clarkston’s Depot Park on Oct. 21, 2017. Pictured standing: Elise Rose of Northampton, Mass. 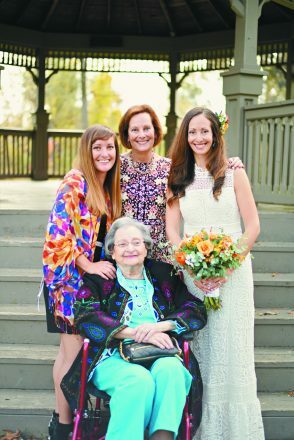 ; Shelley Yorke Rose of Waterford; Stephanie Rose of Denver; and (seated) Florence Yorke of West Bloomfield. Florence is the matriarch, born in 1925 in Detroit. Her daughter, Shelley, was also born in Detroit, and Shelley’s daughters, Stephanie and Elise, were born in Rochester. This photo was taken at Stephanie’s wedding. 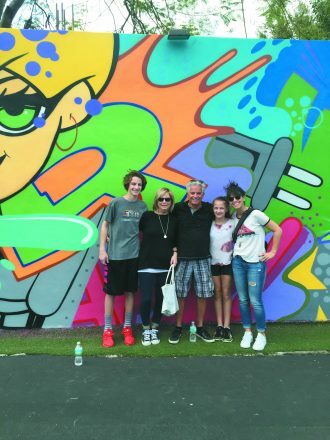 From 2016: Nira and Bob Slutsky of West Bloomfield with their daughter Lauren Slutsky Belchinsky and grandchildren Lola and Ari, all of Huntington Woods. ← How Do You Explain The Holocaust?